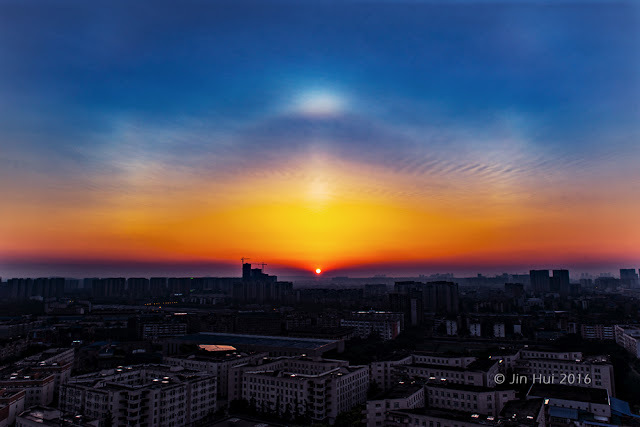 On the evening of Sep 5, 2018, an odd-radius plate display of great significance was captured in Haikou, China, by photographer Zhan Guorong. The photos, when enhanced, reveal an elusive coloured arc between 24° and 35° plate arcs, which doesn't fit into any ordinary odd-radius halo families. The arc was later confirmed by Dr. Nicolas Lefaudeux to be the exceedingly rare 28° plate arcs, which previously had only two known records world-wide. They were first observed in the 1997 Lascar display in Chile (http://www.thehalovault.org/2008/12/lascar-display.html), and spotted for the second time in Chengdu, China by photographer Jin Hui on July 20, 2016. 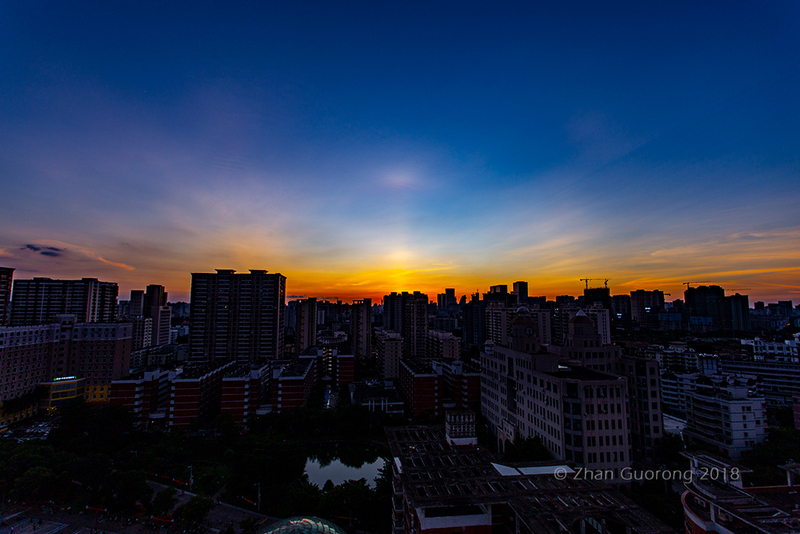 We've got permission from Jin Hui to share his great capture to the world. Unlike the Lascar display which lasted for almost a full day with many new arcs/halos discovered, displays in Chengdu and Haikou were short-lived with no other new arcs/halos apart from the 28° plate arcs. The lack of associated arcs and restricted solar elevation make it difficult to fully understand what really happened up in the clouds. 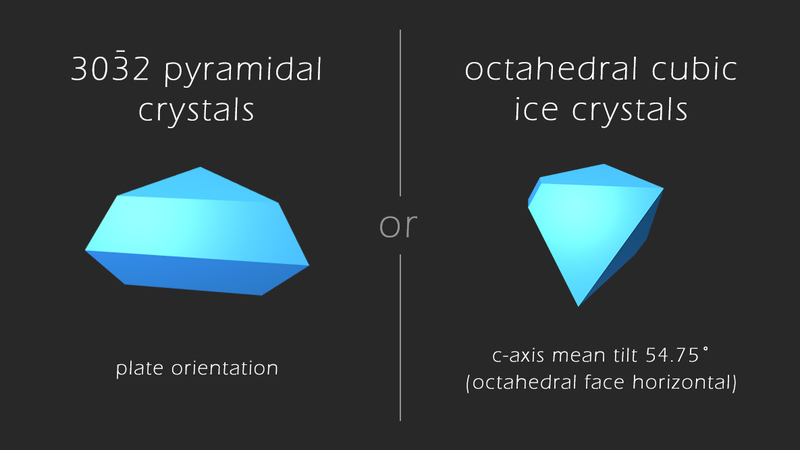 Isolated 28° plate arcs can be reproduced in simulations by either triangular pyramidal crystals with 30-32 pyramidal faces  or octahedral cubic ice crystals with an octahedral face horizontal . Both models require rather restricted shape/orientation conditions. Dr. Lefaudeux brought up another interesting point. The 9° and 24° plate arcs were totally missing in Lascar, implicating the absence of middle column sections in the pyramidal crystals. In Haikou and Chengdu though, they were present and quite strong. Are these displays simply variants of the Lascar display with different crystal combinations? Or are we looking at a totally new breed? We'll need more photos at different solar elevations to unravel the mystery. Good news is that now we know such displays can probably occur anywhere. Before the Haikou case, we thought that the responsible crystal clouds are high mountain related since Lascar and Chengdu sit beside the Andes and the Himalayas respectively. The clouds responsible for what happened in Haikou, however, had their origin in the middle of South China sea. We encourage skywatchers world-wide to keep an eye out for these elusive arcs. They might just pop up in the next odd-radius display over your backyard. No way! Another 28d arc sighting? ?